This Star Trek tie-in novel features Agents Lucsly and Dulmur of the Department of Temporal Investigations from Deep Space 9. At one point, Lucsly refers to previous temporal causality loops, including the Tigellan chronic hysteresis of Stardate 8009. The Tigellan chronic hysteresis is a reference to the Doctor Who serial "Meglos." Although most of the Doctor's exploits take place in an alternate reality to the Crossover Universe, it has been established that he does have a CU counterpart, who sometimes goes by the name Doctor Omega. The time travel devices in a Federation storehouse include large, blue boxlike artifact and an ornate ancient time carriage with a large disk at its rear. The boxlike artifact is the Doctor's TARDIS, while the ancient time carriage is from H.G. Wells' The Time Machine, with this description being based on George Pal's 1960 film. Cyral Nine says that agents of the Aegis such as herself "stop meddlers from tampering with history. We're not just out for general do-gooding like those damn androids." "Those damn androids" are from the TV movie The Questor Tapes, which was developed by Star Trek's creator Gene Roddenberry. Finally, the Aegis homeworld is described as having silver trees and an orange sky, which matches the description of Gallifrey, the Doctor's home planet. Either the Aegis' homeworld is the Gallifrey of the CU, or the two worlds are somehow connected. I've not read it. The book has an interesting concept. I like it when an Expanded Universe focuses on something other than the main characters. Makes it seem like the Universe is better developed. This could easily be a Crossover of the Week entry. 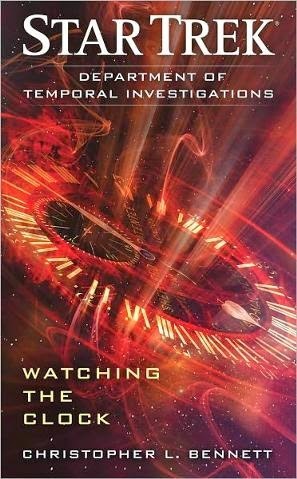 If you're at all interested in Star Trek or time travel in general, definitely read this book. It's one of the best time time travel stories I've ever read, and it's a fantastic ST novel, as it draws heavily upon established lore. The author actually manages to reference every single time travel story in all five ST series and from the films (as well as a few stories from the novels and comics), and works them together in a brilliant, harmonious whole. It sounds interesting. I'll keep an eye out for it. I went through a period where I held media-tie in disdain. That seems snobbery to me now.